Tonight’s double fortune cookie on the left, compared with the non-enhanced one on the right. Did you know that Robyn Hitchcock once recorded a song with the word “radio” in the chorus, and a Sacramento reference in one of the verses? I can’t tell you how much that’s always tickled me, and we started off this week’s show with that one. Honestly, the Sacramento reference seems so random–and if I ever get the chance to interview him, my first question is going to be about exactly that! 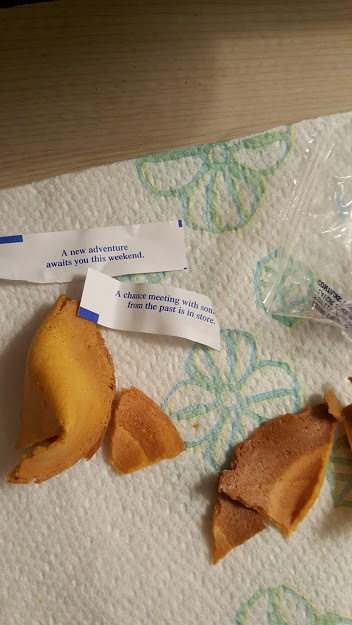 Your two fortunes for 4/9/2019. So we mixed/blended/forced together a whole bunch of great songs, from all over the rock’n’roll spectrum, for your consideration. No barriers here. Not even any common sense or conventional wisdom. I mean seriously, who segues from Old 97s to Roger Joseph Manning Jr., and lives to tell the story? This guy does, that’s who! How about a Led Zeppelin sandwich, with The Armoires and Sean O’Brien and His Dirty Hands as the bread? Check. New music from Kenny? Who? If you’re from this area, you’ll know that Kenny is the name of Anton Barbeau’s Sacramento band, aka Antband Kenny. This may be the first time they’ve recorded under the moniker of Kenny, though, so we’ve got that too. And as often happens, I bring too much music to the party, way too much to finish in my allotted 3 hours, so I was forced to go into double overtime. I swear, it gets so late in the Central and Eastern time zones, that the management doesn’t even monitor what I’m doing. Don’t tell them, but I really do get away with a lot of stuff on my late night Tuesday shows. And by the time I was getting bleary-eyed, I ended the last moments of the overtime with the perfect Frank Black song–Fazer Eyes. It fades out with what can only be described as a sideways guitar solo. The show was peppered with brand new 2019 music as well. It continues to surge into my mail and email, and it’s all of such great quality across the board. I’m happy to play it all for you. I also had the pleasure of chatting with some great listeners and some great fellow DJs through the course of the night. Oh–and this week’s Fortune Cookie Report had its own version of overtime. 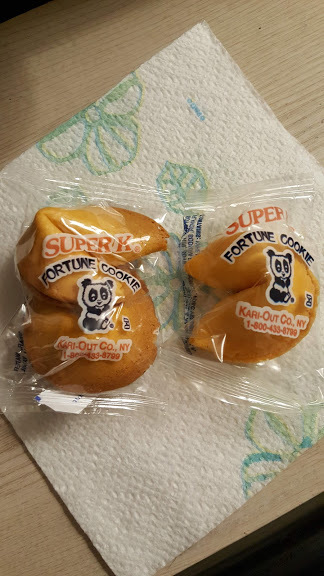 I opened this cookie wrapper that had two fortune cookies inside, so you’re getting two fortunes this week. All in all the evening was completely exhilarating. I hope you’ll give a listen. Matt Langlois | Let Your Sunshine Out | Merde!